Caves are an inexhaustable issue all around the lake Baikal. A lot of them are already discovered and mapped by enthusiatic speleologists. Others are, if at all, known only from hearsay and promise loads of secret beauties created by nature. Lets also keep in mind the importance of these caves as an archive of the paleoclimate, that means the climate of ancient times and its changes until now. While research is done in all possible branches of earth science all over the world, there are undreamed-of possibilities in Siberian caves and a great many of discoveries and experiences are waiting for motivated speleologists. In summer 2003 one of these research expeditions was carried out by the speleological club "Arabika" from Irkutsk to the Polytechnic Cave at Pribaikalsk National Park. The aim of this expedition was to create a map of the cave, which has been known since the sixties, and to take samples for further climate research at the Research Institute for Earth Science (GFZ) in Potsdam (Germany). 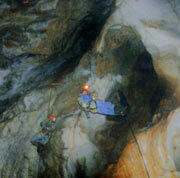 Although the Polytechnic Cave is located only 12 km away from Irkutsk, it is hard to reach. We set up the camp at a little creek. The way was difficult but we were "lucky", because some bulldozers had torn some aisles into the forest thicket. First we explored the cave and searched for some more entrances. We dragged the equipment up the scarp close to the entrance and set up a platform for changing clothes and also for working. The following day we went underground for the first time. The "Politecha" has a two-level passage system, which orientates itself on fissures and disruptions in the rock. Hitherto it is only accessible with alpine equipment and has just one entrance. It got its name from its first explorers from the Polytechnical School of Irkutsk (todays University of Technology), who descended into the cave under adventurous conditions in the Sixties. After a short climbing part, we reached the first level where we put down our equipment because there were a couple of horizonal passages which partly were quite high and followed some clefts.There weren´t many stalactites and stalagmites, but in some cavities we found beautyful coralites (cave coral) as a sign of former floodings. We could also discover several water level marks of varying ages. The ground of this level was covered with brocken dripstone, which once mantled walls and ceiling. Some unknown event caused this "stucco" to go to pieces. Big stalagmite remainings, partly broken, tell about the erstwhile magnificance. Our cameraman came to this level, while we moved down to the second level, which we could only reach by abseiling through a narrow hole in the ceiling of a rather wide cave. We reached a debris slope whose end was lost in the dark. We climbed down and discovered traces of former visitors: a booklet with inscriptions and remnants of cave gear. We moved further through a narrow joint and reached the actual second level. Still we had not needed any climbing equipment. Slowly we crawled through mud and debris. Now and then we saw beautyful purely white stalictites and awesome dripstone formations on the walls. The passages soon became narrower and we had to wait. Sasha and Olga had already passed a unbelievably narrow joint and entered another fissure passage for mapping. For security reasons Katja and I listened to every noise and comment they made. Behind us, another steep passage lead into the depth. While Katja was waiting, I crawled down. After about 20 m the passage ended. Here former visitors had tried to dig themselves through the clay. After all, they could make it through 8m sticky clay, not bad! Another 2 meters maybe, or more? No one knows what´s there underneath. After a couple of hours we got back to the surface, frozen to the marrow. We were hungry and dirty. Anyhow, the first impressions were overwhelming.The next days we were busy with taking pictures, filming, mapping, assaying and setting up the climate station. On the antepenultimate day of the expedition, we saw smoke arising on the other side of the valley. After a short talk we were on our way to play fire brigade. A piece of woodland of several hundred square meters was on fire. If we hadn´t been able to stop the fire, it would have reached our camp and we would have needed to abort our expedition. We were all conscious about the risk and started to eradicate young trees to hit the flames. It was a sisyphean labor, because all the time new trees went up in flames. The ground was glowing and beneath the moss the fire was unquenchable. The smoke took our breathes away and only slowly we could take control over parts of the fire. But up the hill there was no chance of putting out the fire, because a faint wind drove it on and on, tree trunks were exploding and it was impossible to approach. Only a small part of the fire was extinguished. Totally exhausted, we could be sure that it would not reach our little camp. The following days the air was smokefilled and we needed to check every night how close the flames had approached. We did not see one bear, but the fire came closer and closer. Anyhow we were able to finish our set tasks. Now we had to take the strenous way back to the valley - passing the fire and reaching the former origin of fire, where only a couple of strong trees and black stubs were left. We took a break. As soon as we started eating, our appointed truck arrived to pick us up. That meant a big jig for us, because we actually thought we would have to drag all the luggage, the samples and ourselves up to the pass, which was 700 meters higher up the hill. The GAS 66 and its driver had actually passed an impassable way. The expedition was a complete success. Now we will have to analyse the samples. This work will last until spring 2004 or maybe longer. Then perhaps a small piece of climate history of a region, which still has a lot of secrets, can be reconstructed.